Solid strategies, the wisdom of peers and an upbeat realism were the themes driving last month’s Bridging Session for international advocates and technology groups promoting transparency. Like our 2011 session, the event sought to build bridges between policy and technology experts. Participants from five continents met in Glen Cove, New York from November 27 through November 30. The attending NGOs shared a commitment to improving disclosure and citizen knowledge about government budgets and natural resource wealth, but many of the week’s lessons turn out to apply across all forms of advocacy. Web sites and mobile tools can help citizens and leaders improve governance and uncover corruption, but the full potential of these tools often remains untapped. Through the “TABridge” project, the Transparency and Accountability Initiative (T/AI) seeks to improve collaboration on tech projects by identifying gaps in knowledge and improving funding strategies. Some presentations were highly structured, to expose people to a range of tools and methodologies, but the majority were small, member-led discussions, based on topics chosen cooperatively and refined by an organizer group including Aspiration Tech, Harvard University’s Transparency Policy Project, the International Budget Partnership, Revenue Watch Institute and the T/AI. While the 2011 event invited participants to understand each other’s work and communicate more effectively when planning tech projects, this second annual meeting emphasized the need for both campaigners and technologists to understand the entire context underlying any project where technology might make a difference. 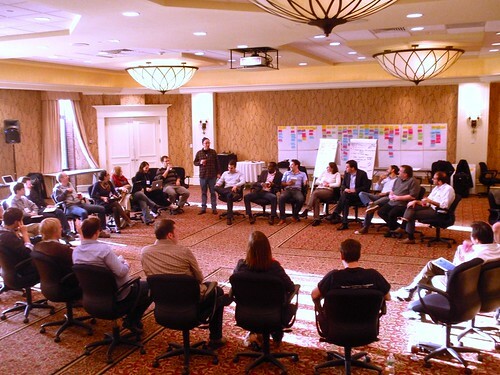 What is the community and organizational context a tech project needs to succeed? What uses of open data, data visualization and mobile tools can lead to real impact on policy and community organizing? Are donors and their grantees on the same page about how to plan, propose and support technology projects effectively for transparency and good governance? To deepen strategic thinking, participants were asked to choose one project and illustrate its strategy in a drawing. Some drawings laid out goals, obstacles and “moving pieces” in a simple narrative. This drawing from TALC Zambia shows how the organization helps citizens track shortages in medicine, creating two-way communication between local communities and medical resources, and between TALC and the groups that can help reduce shortages. Some drawings, however, looked more like illustrated “task lists” than strategy designs. Organizations need to remember that a strategy must be more than what they do: It’s how their actions tie in to the changes they seek. Participants picked apart strategies and shared experiences throughout the week, exploring the intellectual underpinnings of “theories of change” and huddling in intimate one-on-one advisory sessions. The more experienced technologists helped others go beyond the latest buzzwords and trends in digital advocacy, like “open data,” “visualization” and “crowdsourcing.” Discussing uses of government data, Lucy Chambers of the UK’s Open Knowledge Foundation said advocates should also look to the “supply side” to improve data management, by working directly with the agencies that release such data. Her view was reinforced by fellow facilitators from Chile, Uruguay and the U.S. In a talk on using data to support advocacy, participants from Mexico, India, Russia, Tanzania, Zambia, Chile, London and the U.S. worked together to create a checklist for a data-driven campaign. See a first version of the checklist here. Nearly all attendees wanted to know more about data visualization. Facilitators from the U.S. and Nigeria led multiple talks to demonstrate the good practice and thoughtful planning that make an infographic or map more than a pretty picture. Non-profit strategist Dirk Slater suggested thinking about good visuals in terms of “three gets:” Get the idea, get the story and get the detail. A holistic approach to tools figured in our talks about “crowdsourcing” (itself a buzzword that has come to mean everything from citizen map-making to group decision-making to mass storytelling). Hollie Gilman of Harvard’s Transparency Policy Project asked attendees to discuss their needs, assumptions and knowledge gaps about gathering citizen input. Groups then compared notes and faced the reminder that one size never fits all with tools like mobile phones and databases. Some kinds of information may look good on a map, for instance, but be more understandable shown as a pie chart. Or you may have a lot of data but no way to convince skeptics that it is reliable. Or you may be texting reporting instructions to people with low to no literacy. “Think before you tech,” continues to be a central theme. “Sometimes the best mobile data collection tool is pen and paper,” one participant said, or a voice message that be saved and added to a database. We were fortunate to have several donors attending from foundations that support fiscal and natural resource transparency around the globe. Coming in the next blog post, notes from a candid conversation among donors and grantees about how two-way communication can ensure more successful tech projects. Organizers and participants are working to distill highlights and write reflections on how knowledge from the TABridge event will influence their day-to-day work. Our growing community will be connecting online and in our respective cities in the weeks to come to reinforce the lessons learned so far, and rethink how we, our colleagues and our peers do our work.